An afternoon of Scottish music fills the air at the Annisquam Village Church when Parcel of Rogues comes to play their irrepressible jigs, reels, and strathspeys. 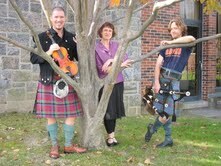 It is rumored that the concert will include a bit of dancing and piping, as well, with plenty of kilts and tartans about! Shortbread and tea follow the concert. The historic Annisquam Village Church is known for its superb acoustics. Tickets at the door only: $15/$5 student.